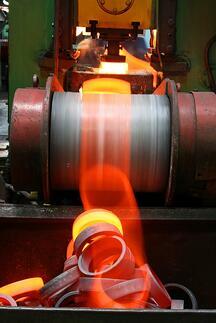 Like any industrial part, hardworking bearings are subject to fatigue from a number of different sources. One important factor to keep in mind for bearings is the effect of rapid speed changes on bearing service life. If companies do not use bearings that are engineered specifically to withstand high speeds and rapid changes, these speed changes can cause slippage in the rolling elements and raceways of bearings, in addition to increased wear and degradation of cage guiding faces. • Cage Damage — While cage damage can be the result of many different factors, one of the primary causes is a rapid change in speed. When subject to excessive acceleration and retardation, pressure can rise considerably between the contacting surfaces. This often results in stress and fatigue, potentially causing costly bearing failures. • Broken Retainers — When used at higher speeds, inertial forces within bearings increase. Frequent stopping and starting combined with inadequate lubrication leads to high forces between the retainer and the rolling elements, resulting in crack in the retainer. To avoid the damage caused by rapid speed changes, it is essential for engineers to choose the most appropriate bearings for the given application and provide proper lubrication throughout the life of the bearing. • Proper Bearing Selection — Selecting the ideal bearing suited for your specific project need ensures that your bearing will be prepared to handle the application without premature degradation. For example, bearings with smaller rolling elements and cross-sections can help reduce the mass of rotating bodies. This provides optimal adaptation to harsh conditions like rapid acceleration and retardation. • Proper Bearing Lubrication — Lubrication acts as a cushion between a bearing’s rolling elements and cage. The increased stress caused by rapid speed changes increases the need for re-lubrication to diminish the risk of bearing damage over time. At Emerson Bearing, we maintain a complete array of solutions for virtually any bearing need. To learn how to prevent costly downtime and other results that occur from bearing failure, check out our Emerson Bearing Failure Analysis guide. The guide will help you to choose the best bearings for your applications, maximize efficiency and prevent bearing failure in the future.